HPSFT. It's not a stock exchange symbol nor is it similar to H1N1. 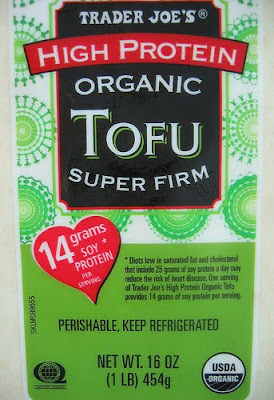 Nope, its 'High Protein Super Firm...TOFU'. But similar to the stock exchange and H1N1, Tofu has had its press in the news over the years. However, this item is a plus to your health in more ways then one (unlike the stock exchange these days and piggy-flu). With High Protein think 'lean muscles' and with Super Firm think 'lookin' hot'. Add them together and you are lookin' hot with lean muscles. At least that's the way we envision the health benefits of tofu. Naturally made, and naturally good for you, 14 grams of soy protein make your heart smile. And who doesn't enjoy a smiling heart? Smiling hearts lead to smiling faces. So let's battle the economy and H1N1 with smiling hearts and faces. This is the best tofu, my dishes turn out perfect! You haven't tried tofu until you've tried Meiji Tofu in Gardena. It's a shame that you won't sell this in your Virginia stores or even let me special order it. This tofu is now available in the Springfield, VA store!! It is fabulous!!! Is this tofu non-gmo? And how can I tell? Thanks! GMOs are forbidden to use the USDA organic seal. Because it is organic, you can be assured that it is not GMO. Working towards a vegetarian diet and this makes it easy... tried using TJ's other super firm tofu to stirfry, but still got crumbly. This is awesome. Has great mouthfeel, stays together and reheats well the next day without getting gummy.